Enjoy the bouncing antics of feeding squirrels with this unique bungee feeder. Works with corn cobs, Squirola KOB and Squirola Big Ol' KOB. 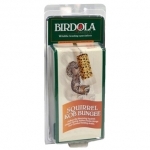 Feathered Friend Squirrel Munch Box Feeder features 3/4 in. native white pine, stained with non-toxic brown stain, stainless steel hardware. Fill munch box with peanuts or sunflowers and watch squirrels lift easy open top to feed. Front viewing window to monitor food level. Size is 10 in. height x 7 in. width x 10 in. depth. 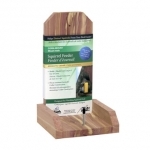 Feathered Friend Squirrel Table Feeder features 3/4 in. native white pine , stained with non-toxic brown stain, stainless steel hardware. Enjoy squirrel antics eating cob corn from feeder. Size is 13 in. height x 5 in. width x 10 depth. By simply turning the window pane you have a squirrel feeder or bird feeder. Remove plastic for nesting box. Made with aluminum hinge. Holds 3 lb. of seed. Made of rot resistant cedar, proudly made in the USA by Amish craftsmen. Holds a single ear of corn. placing a squirrel feeder away from bird feeding Stations helps distract squirrels from bird feeders. Pole or tree mount. Cedar construction proudly made in the USA by Amish craftsmen. Metal Squirrel Feeder, holds peanuts, corn and large seed. Durable chew resistant powder coated steel body. Quick release for easy filling and cleaning. Hardware included for fast mounting to tree, pot or deck. The durable Audubon Ear Corn Feeder will provide great pleasure and easy access for your squirrels. 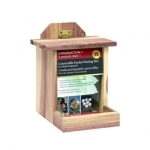 The Audubon Munch Box Feeder provides delightful entertainment for the squirrels and you. Fill with a squirrel mix and watch the squirrels lift the lid and dig out treats. Mount on a post, tree or deck and watch the fun begin. This is a fun new feeder to watch squirrels entertain you!! The Tractor Cob Feeder holds 2 ears of corn and there are multiple spaces for the squirrels to sit and eat away as they look like they are driving a tractor. This high quality, all metal feeder will last for many years and is very durable. It is coated with polyester finish to keep it weather-resistant.